1. 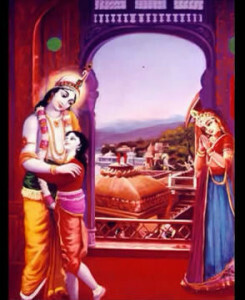 Pradyumna ( प्रद्युम्‍न) was the son of Krishna and Rukmini, and was an incarnation of Kama, the god of love. 2. When he was a baby he was abducted by the demon Sambara. 3. He was then cast into the sea and swallowed by a fish, but that fish was caught and carried to the house of Sambara. 4. The fish was opened and the child was found inside. 5. He was given to a woman named Mayawati(who later became wife of Pradyumna) in Sambara's house to raise. 6. Narada informed her about the true identity of the child. 7. 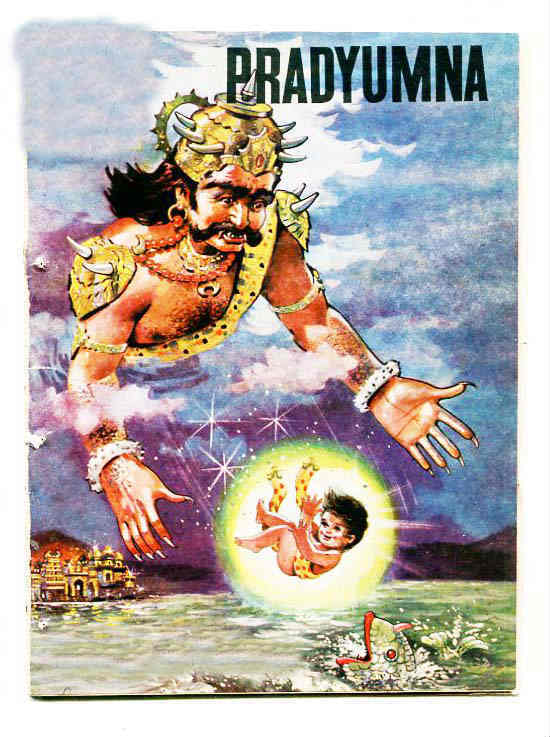 When Pradyumna grew up, he battled the demon Sambara, defeated him. 8. Pradyumna married Mayawati and bore a son with her named Aniruddha. 9. Pradyumna was later killed in a brawl in his father's court at Dwaraka. 1. Kamadev, who is directly part and parcel of Lord Vasudeva and who was formerly burned to ashes by the anger of Lord Siva, took birth in the womb of Rukmini begotten by Krsna. 2. 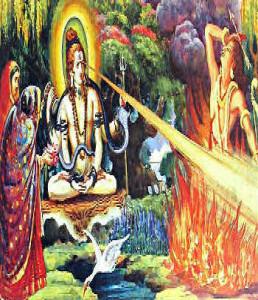 When Kamadev was burned into ashes by the anger of Lord Siva, he merged into the body of Vasudeva, and in order to get his body again, he was begotten by Lord Krsna Himself; he was directly released from his body in the womb of Rukmini and was born as the son of Krsna, celebrated by the name Pradyumna. 3. Because he was begotten by Lord Krsna directly, his qualities were most similar to those of Krsna. 1. There was a demon of the name Sambara who was destined to be killed by this Pradyumna. 2. Sambara demon and as soon as he learned that Pradyumna was born, he took the shape of a woman and kidnapped the baby from the maternity home less than ten days after his birth. 3. The demon took him and threw him directly into the sea. 4. When Pradyumna was thrown into the sea, a big fish immediately swallowed him. Later on this fish was caught by the net of a fisherman, and the fish was later on sold to the Sambara demon. 5. In the kitchen of the demon there was a maidservant whose name was Mayavati. 6. This woman had formerly been the wife of Cupid, and had been called Rati. 7. When the fish was presented to the demon Sambara, it was taken charge of by his cook, who was to make it into a palatable fish preparation. 1. When the cook was cutting the fish, he found a nice baby within the belly of the fish, and he immediately presented him to the charge of Mayavati, who was an assistant in the kitchen affairs. 2. This woman was surprised to see how such a nice baby could remain within the belly of a fish, and the situation perplexed her. 3. The great sage Narada then appeared and explained to her about the birth of Pradyumna, how the baby had been taken away by Sambara and later on thrown into the sea, and so on. 4. In this way the whole story was disclosed to Mayavati, who had formerly been Rati, the wife of Cupid. 5. Mayavati knew that she had previously been the wife of Kamdev; after her husband was burned into ashes by the wrath of Lord Siva, she was always expecting him to come back again in the material form. 6. Miraculously, the baby very swiftly grew up, and within a very short period he became a very beautiful young man. 7. His eyes were just like the petals of lotus flowers, his arms were very long, down to the knees, and any woman who happened to see him became captivated by his bodily beauty. 8. Mayavati could understand that her former husband, Kamdev, born as Pradyumna, had grown into such a nice young man, and she also gradually became captivated. 9. She explained the whole rebirth story of theirs, & the fact that Narada Muni had told her about Pradyumna being Lord Krishna's Son. 1. Pradyumna immediately went before Sambara and challenged him to fight. 2. Sambara felt the words of Pradyumna as if they were a kick. He immediately took his club in his hand and appeared before Pradyumna to fight. 3. In great anger, he began to beat Pradyumna with his club. 4. 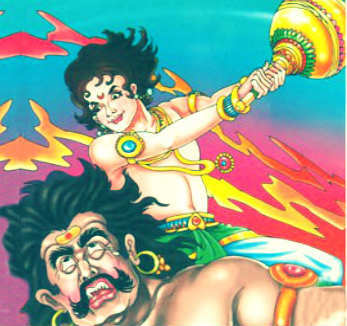 Pradyumna protected himself with his own club, and eventually he struck the demon very severely. In this way, the fighting between Sambarasura and Pradyumna began very seriously. 5. But Sambarasura knew the art of mystic powers, he thus raised himself high in the sky and began to threw various types of weapons at the body of Pradyumna. 6. Understanding that his enemy was formidable, Sambara took assistance from various kinds of demoniac mystic powers belonging to the Guhyakas, the Gandharvas, the Pisacas, the snakes and the Raksasas. 7. Despite thi, Pradyumna was able to counteract his strength and powers by the superior power of mahavidya. 8. When Sambarasura was defeated in every respect, Pradyumna then took his sharpened sword and immediately cut off the demon's head. 1. 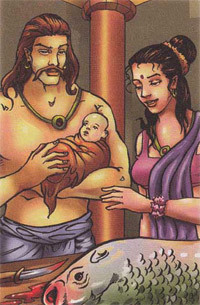 Pradyumna & his wife Mayavati, directly reached his father's capital, Dvaraka. 2. They reached the inner section of a palace known as antahpura (private apartments). 3. Pradyumna and Mayavati could see that there were many women there, and they sat down among them. 4. When the women saw Pradyumna, dressed in bluish garments, with very long arms, curling hair, beautiful eyes, a smiling reddish face, jewelry and ornaments, they first of all could not recognize him as Pradyumna, a personality different from Krsna. They all felt themselves to be very much blessed by the sudden presence of Krsna, and they wanted to hide in a different corner of the palace. 5. When the women saw, however, that all the characteristics of Krsna were not present in the personality of Pradyumna, out of curiosity they came back again to see him and his wife, Mayavati. 6. Among the women was Rukmini-devi, who was equally beautiful, with her lotus-like eyes. Seeing Pradyumna, she remembered her own son. 7. Simply by intuition, Rukmini could understand that Pradyumna was her own lost son. She could also observe that Pradyumna resembled Lord Krsna in every respect. 8. At that very moment, Lord Krishna, along with His father and mother, Devaki and Vasudeva, appeared on the scene. Krishna, could understand everything, yet in that situation He remained silent. 9. However, by the desire of Lord Sri Krishna, the great sage Narada also appeared on the scene, and he began to disclose all the incidents--how Pradyumna had been stolen, and how he had grown up and had come there with his wife Mayavati, who formerly had been Rati, the wife of Kamdev. 10. When everyone was informed of the mysterious disappearance of Pradyumna and how he had grown up, they all became struck with wonder because they had gotten back their dead son after they were almost hopeless of his return. When they understood that it was Pradyumna who was present, they began to receive him with great delight. 11. One after another, all of the members of the family--Devaki, Vasudeva, Lord Sri Krsna, Lord Balarama, and Rukmini and all the women of the family--began to embrace both Pradyumna and his wife Mayavati. When the news of Pradyumna's return was spread all over the city of Dvaraka, all the astonished citizens began to come with great anxiety to see the lost Pradyumna. They began to say, "The dead son has come back. What can be more pleasing than this?"